nancye's art and beautiful junk: It's Finished! At Last! It is finished and ready to go on sale. This is my first edition and I am self publishing for now. The booklet is 18 pages full of simple directions that will allow you to learn how to make these adorable dolls for fun and profit. If you are interested in purchasing my instruction booklet for $15.99 plus shipping of $2.00 in the US, you can email me by clicking the email button on the right side bar. I hope you enjoy the booklet and that the information is a big help to you. 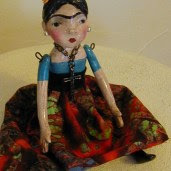 I think you will be pleasantly surprised by how simple these dolls are to make. Thank you for all your support, but mostly, have fun! I'm just stopping by your blog for the first time! You do beautiful work, and I'm sure your booklet will be a success. This looks great! how much would shipping to the UK be?